People's Democratic Party has issued a statement that the two House of Representatives members who recently decamp to APC from PDP will have to Vacate Our Seats. 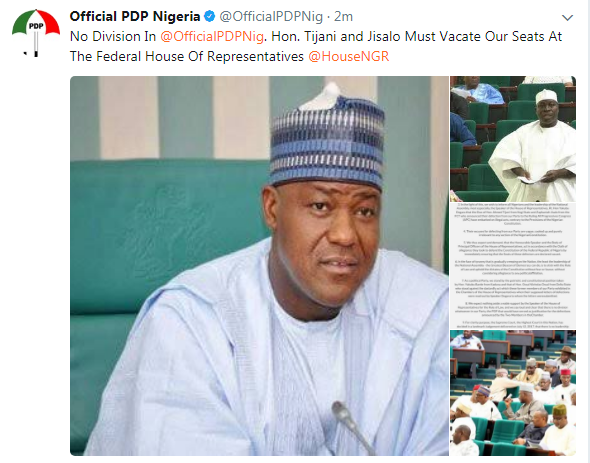 The Two House of Representatives members on Thursday cross-carpeted from the Peoples Democratic Party, PDP, to the All Progressives Congress, APC. The lawmakers are Zaphaniah Gisalo representing Abuja Municipal Area Council/Buari and another member, Mr. Yusuf Tijani from Okene/Ogori-Magogo federal constituency of Kogi State. Both lawmakers cross carpeted on the floor of the House amid wide protest from PDP lawmakers. THEY JUST MOVED FROM ONE PARTY OF THIEVES TO ANOTHER.